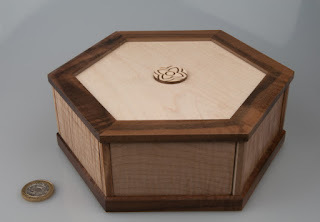 A couple of years ago Kagen Sound (nee Schaefer) announced an ambitious series of puzzle boxes starting with the Lotus Box. 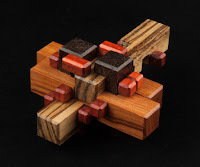 Each would be based on the geometry of his fabulous Lotus Tables and puzzlers would find clues to subsequent boxes along the way… it sounded like fun and the prototypes looked smashing so I signed up. As did, I suspect, another 99 other folks. Over the course of the next two years Kagen would send out the occasional update and post some teasing pics showing bits and pieces of progress (generally piles and piles of gorgeous looking bits!) – until about a month ago when he announced that he was ready to start shipping his Lotus Boxes… I sent him some Paypal and pretty soon a rather large box arrived at Puzzling Times HQ – after the obligatory ransom demand had been paid, of course. 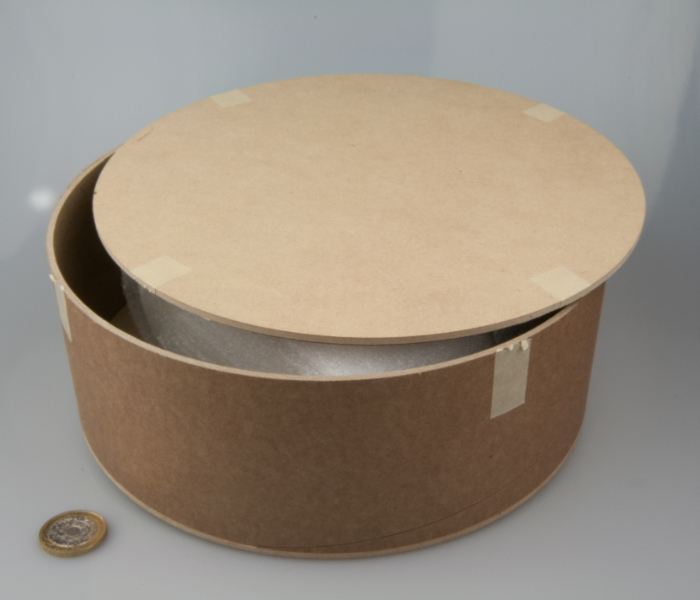 Opening that box was an absolute treat… inside there was a custom-made shipping box made out of MDF and some heavy cardboard tube… opening the lid of the shipping box revealed a very well wrapped Lotus Box… every bit as beautiful as Kagen’s pics had suggested. As with all of Kagen’s boxes, the finish is thoroughly wonderful! This thing glistens in the light and feels gorgeous – and the eight(!) concentric rings all move smoothly between their individual end stops. 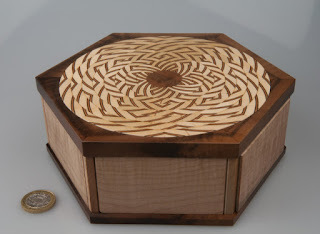 It’s worth just playing around with those rings for a while before you start any serious puzzling – the patterns they create are stupendous – switching radically between patterns with a few small movements on some of the disks. This thing’s trippy! So what’s it like as a puzzle then? 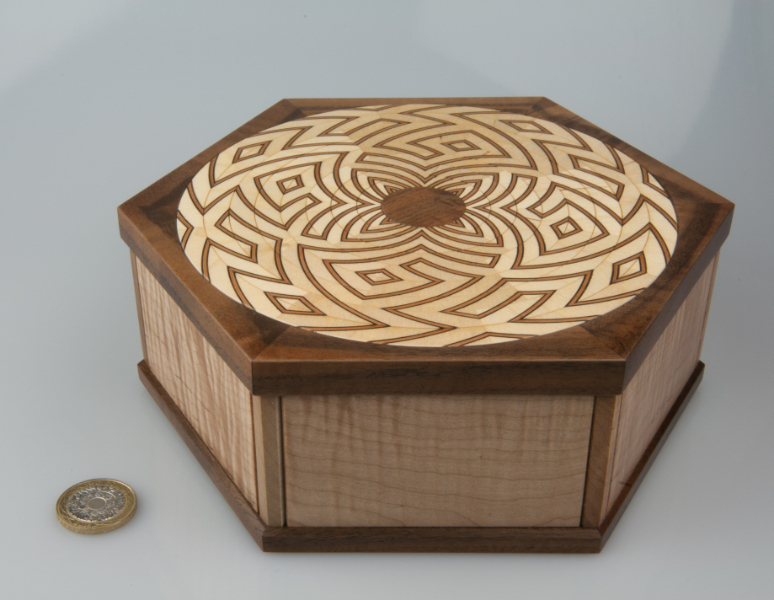 I was able to create patterns one and two reasonably easily, but the third one eluded me for ages… and judging by the comments on my favourite puzzling forum, it’s caused similar levels of puzzlement in others too… it’s easy to get it almost right, then find that you can’t move one of the critical rings far enough to complete the pattern, so you shift things around a bit only to find another one blocked somewhere else – except, when you now unblock that one, the first one blocks up again… repeat. …and then there’s the small matter of finding the pattern for the final drawer… that’s a lovely little twist that might just keep you confused for a little while longer – it’s a lovely little touch… suckers you into a pattern and then break it when you need it the most! 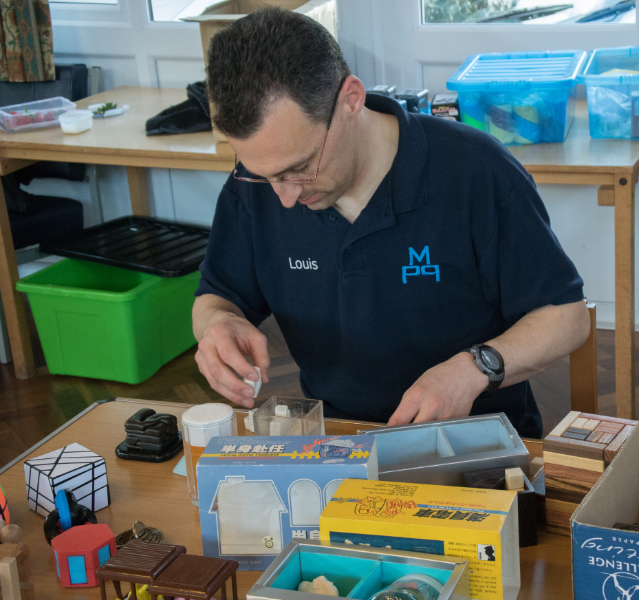 I really enjoyed working my way through opening all four drawers after a particularly heavy day in the office, as a result I can confidently recommend the Lotus Box as a great antidote to the daily grind! 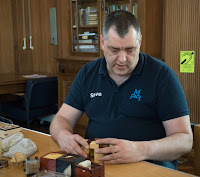 A couple of weeks ago I got to enjoy a wonderfully indulgent weekend away puzzling… Wil Strijbos has an annual open-house / puzzle party on or around the Netherlands' King’s Day holiday. It’s an opportunity for his friends from all around Europe to meet up, play with his puzzles and perhaps even purchase one or two things from the man himself. This year we managed to convince a couple of other MPP-ers to traipse along as well: Steve and Shane flew into Eindhoven on the Saturday morning and I joined them there in the afternoon via Schipol and the extremely efficient Dutch train system. Louis met me at the train station (I managed to find my way that far!) and we got me checked in at the local Holiday Inn where Shane and Steve had also just checked in. 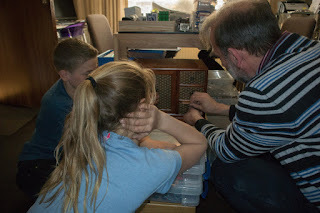 Louis took us back to his place for some gentle afternoon puzzling before Mieke filled us up with a delicious dinner. Things took a serious turn after dinner when we all marched down the road to attempt a room escape at the Eindhoven Escape Hunt Experience which had recently opened up just around the corner from the Coolens… pure chance, eh? Louis collected us from the hotel and we headed cross-country to Venlo where we surprised Wil as he was trying to finish his breakfast – the English are keen, and early, it seems! 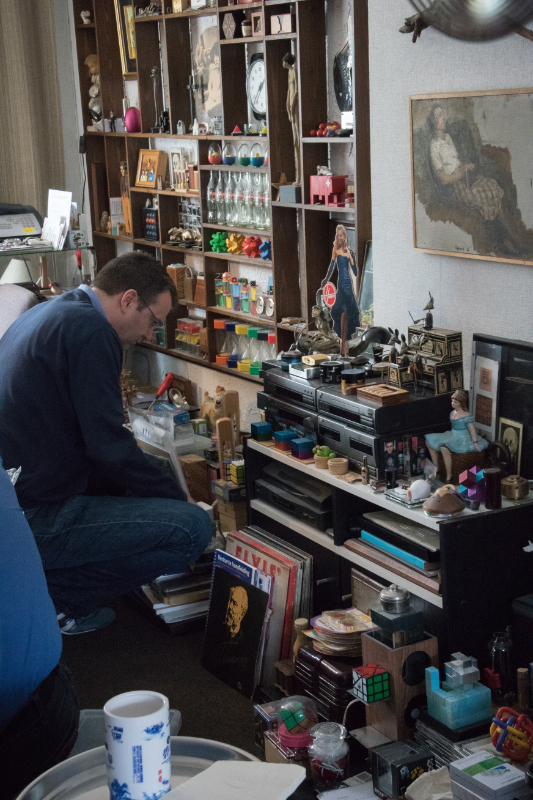 Ushered in, he soon had us coffeed up, relaxed and puzzling in his lounge… among a mythical collection of fabulously rare puzzles… heaven. And then the other puzzlers began arriving, and it was wonderful catching up with old friends I hadn’t seen for a while, and meeting people I’d only swapped emails with for the first time… I’d only been there half an hour and already it was all worth it! Just brilliant! 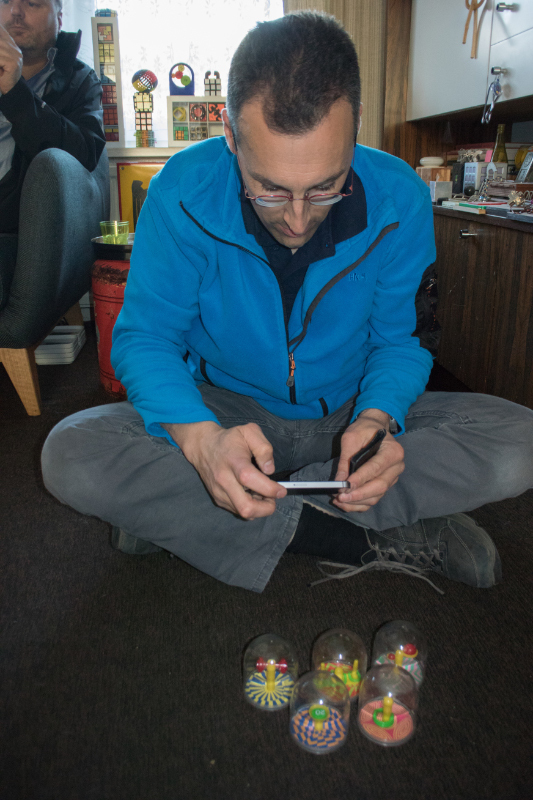 Michel was one of the first to arrive and I found myself sitting on the floor while a few of us played with his new copy of Jack Krijnen’s modified version of Goh Pit Khiam’s Racktangle – with added n-ary-ness… quite a treat. 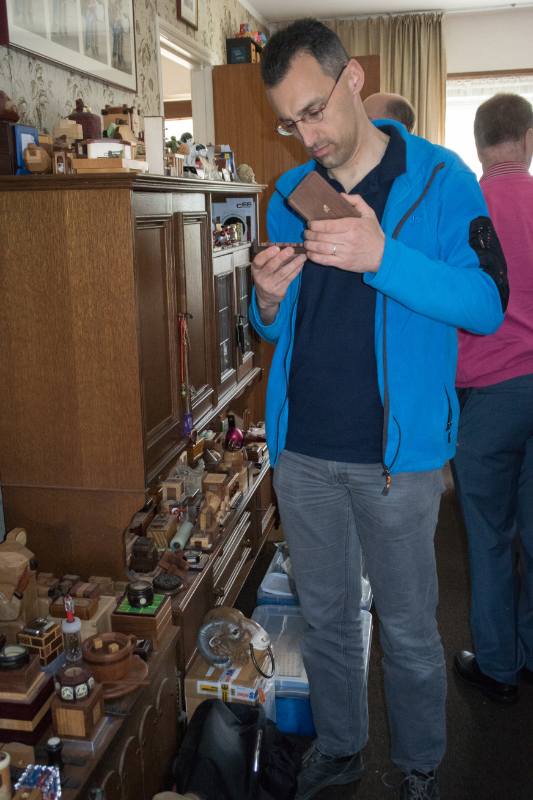 Later on I had a chance to meet Jacques Haubrich who runs some rather nice puzzle auctions from time to time… no prizes for guessing how we know each other! After exchanging emails for ages it was great to meet Jacques and chat puzzles for a while at Wil’s. 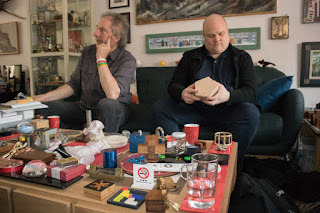 As you might expect, there were a few prototypes of future Strijbos originals lying around and occasionally getting played with – sadly I was not allowed to buy any of them! (Yes, I tried!) 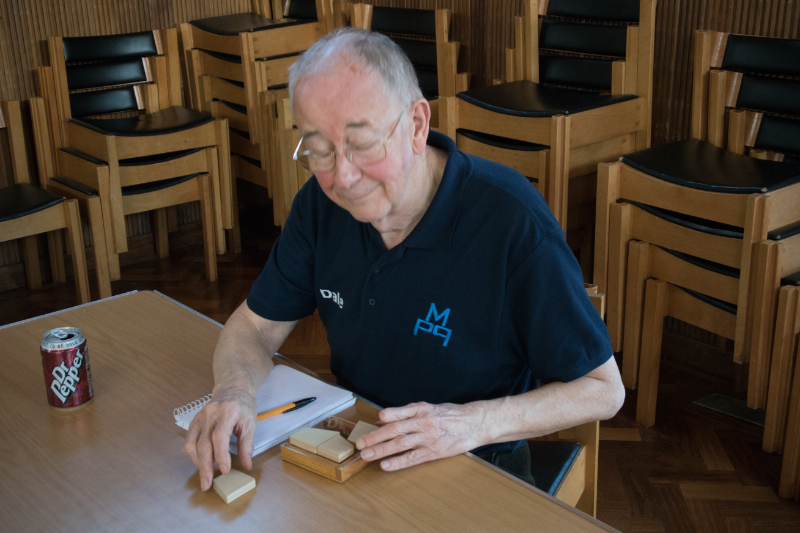 There are some more cracking puzzles to come from this man in the near future… watch this space. Wil had an absolute hoot demonstrating his tricky sewing box with randomly locking and unlocking drawers much to everyone’s amusement – even trying unsuccessfully to GIVE it away a few times… before bringing out a lovely Japanese puzzle chest that Rik and his kids spent a while working their way through… it’s always nice seeing a couple of generations from the same family working on a puzzle collaboratively! I managed to bag a couple of large-scale simple disentanglements to add to my collection and one of my mates managed to score an arboreal herbivorous marsupial - he was mighty chuffed, let me tell you! When all was said and done and most folks had left a bunch of us decamped off to Wil’s favourite Chinese restaurant for a serious banquet of a dinner… and then a few more hours puzzling back at Wil’s place before Louis drove us all back to Eindhoven after a seriously long day’s puzzling… it all made for a brilliant puzzling weekend – thanks Wil, and Louis! 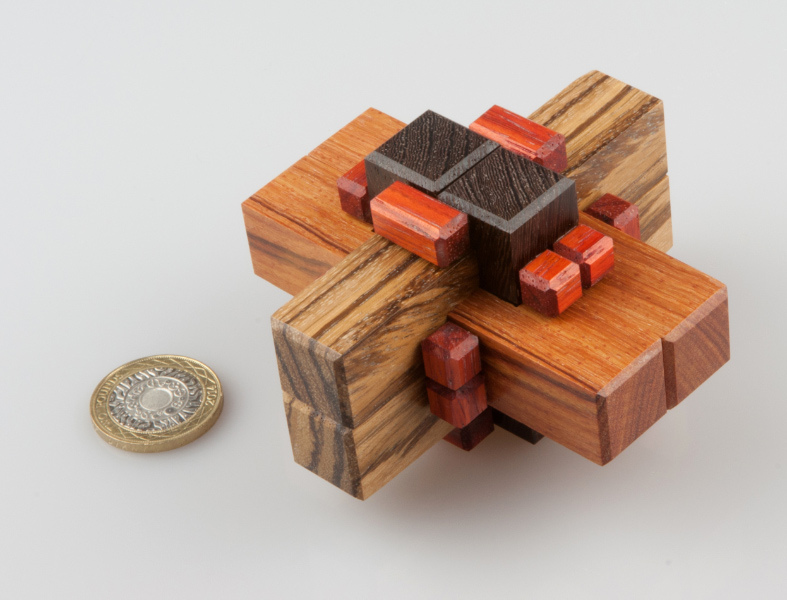 A while back my puzzle-designing mate Adin popped around for a visit and handed me a copy of something he’d designed and made himself… it was a six-piece burr he’d called Amulet and it had me thoroughly confuzzled. 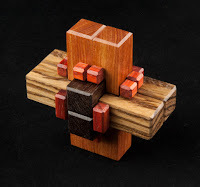 He’s fiddled around with a standard six-piece burr and added a few constraining voxels around the middle and shorted one of the axes… adding those voxels makes all the difference it turns out – without them there’d be 144 solutions, with them the solution is unique… and quite tricky! The first time I met this puzzle I got virtually nowhere with it… so when Adin asked for some feedback, I told him I thought it was a great puzzle and he should make a few, and sell me one! Life intervened for a while and then a couple of months ago he decided the time had come to make a few copies so he canvassed a few puzzlers and pretty soon had takers for all he was about to make… luckily I managed to join the queue in time and at the last MPP Adin arrived with a couple of freshly finished Amulets for a few of us. I’m pleased to say that this time I made a lot more progress and I’m even more impressed with it now that I’ve had some quality puzzling time with it! Those little cubies on the sides really get in the way and stop you from doing an awful lot of useful moves… forcing you to take the one true path to the solution (I told you it was unique!). This is one of those burrs that takes several moves to get pieces in the right state before you can finally (after 10 moves) release the first piece… and then it falls to bits in your hands! Right up until the last moment everything hangs together beautifully – it doesn’t get all sloppy and allow all manner of weird twists and turns – I really appreciate that in my burrs! Putting it all back together is a very serious challenge! ‘nuff said? Terrific burr from a multi-talented designer! 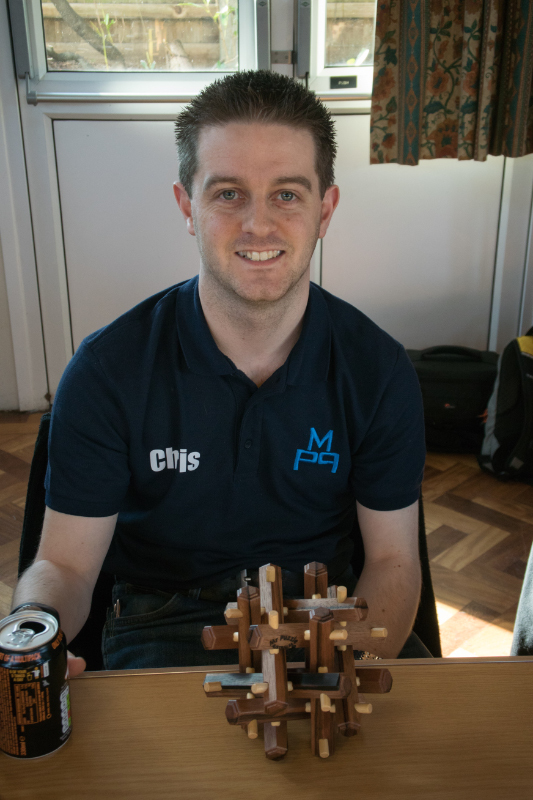 MPP twenty-two turned out to be a reasonably low-key relaxed event with about 10 hardened puzzlers appearing for a day’s banter and puzzling with friends. Louis had made his customary trip across the channel and spent the weekend with Gill and I, starting with some light puzzling on the Friday evening… and yes, as usual I left a row of puzzles to be solved on the desk when I hit the sack and the next morning most of them had been solved… Fantastic service! 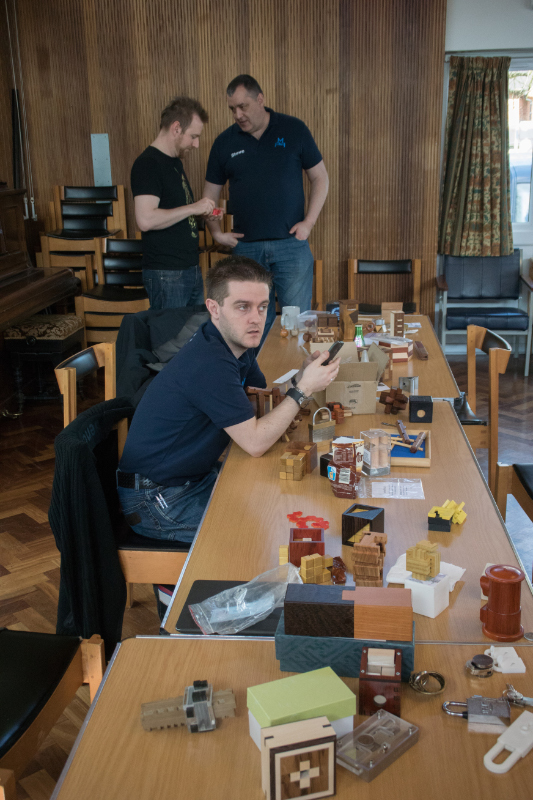 Louis and I managed to get to the hall before anyone else this time and started getting it all set up and before long we had tables and chairs set out and even some puzzlers to chat to. I also found a lovely little ring maze on Tim’s table that has caused me a little bit of inner turmoil – I collect puzzles to play with them, so they don’t tend to stay in their wrapping very long… this little puzzle however is probably more than 60 years old and is still apparently sealed in its original packaging… so do I break the seal and play with it? And would that be a crime? 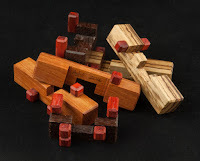 Adin had brought along a few copies of his Amulet puzzle so I eagerly thrust some money in his general direction and exchanged it for a lovely puzzle… which will appear written up in these pages shortly! 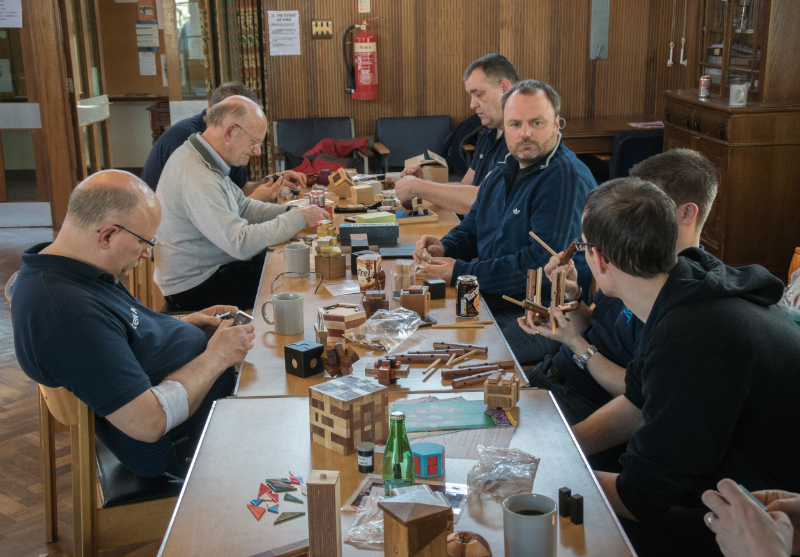 Knowing that Chris really enjoys a challenge, Steve had brought along a set of hexagonal doweled sticks that he claimed was a puzzle – without any idea of the eventual shape, Chris sat down and began experimenting with various constructions. He managed to find quite a few very-nearly solutions that armed him with a pretty good understanding of mechanics – before he reverse-engineered the solution and duly put it all together – particularly impressive for me as at one point there were two rather complicated sub-assemblies getting woven together before the final dowels were inserted to lock it all together… he looked pretty pleased with himself after that… and rightly so! Steve had also brought along a few Toyo Glass packing puzzles that he’d recently acquired for a rather attractive price – several of us had a go at Home Alone Husband – with Oli proving to be particularly adept at that particular puzzle… I’m sure Jack has nothing to do with it! I managed to entertain several people with Jane Kostick’s lovely little triacontahedron box packing puzzle – it’s a simple little box that you need to pack twelve oddly shaped (identical) blocks, and a cube into… it kept quite a few people going for quite a while, and the grins when they finally found the beautifully symmetric solution made the experience all worthwhile. 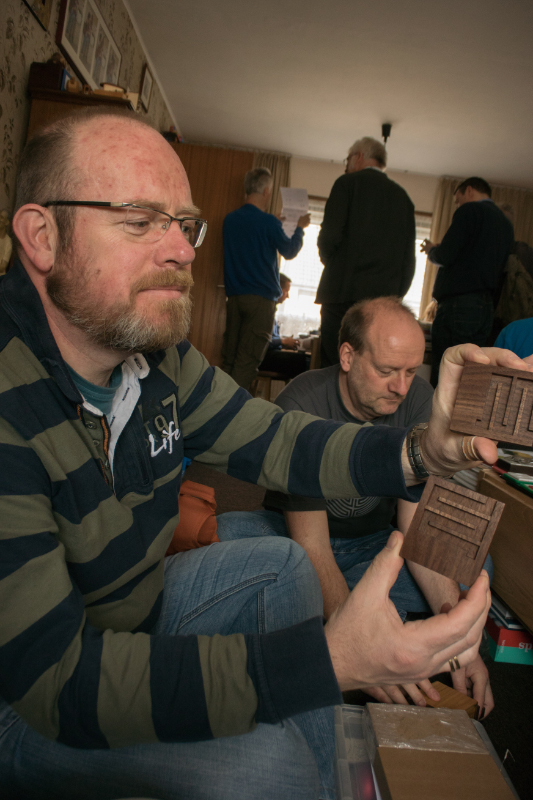 My new copy of Easy Livin’ entertained a couple of people who were brave enough to take it apart – in fairness, after the first couple of moves it becomes very quickly apparent this ain’t no ordinary burr! Steve have been printing up new designs he was playing with and ended up giving me a copy of a 6-piece caged burr on a hexagonal grid… I spent a while trying to extract the first piece and when he saw I was getting nowhere, he took pity on me and sent it home with me… where it’s still safely locked up, the subtle move required to progress still eluding me… when will I learn? Michael Dowle had brought along copies of another new design, Symmetrize, that most people ended up having a go at… it consists of four acrylic pieces with shapes made up of overlapping circles which you are tasked with arranging into a shape that is rotationally symmetrical… I saw Chris come up with a couple of solutions (which I think surprised Michael as he thought there was a unique solution), as did Louis… and once again Mike insisted that I take a copy home for my troubles… (unsolved!) – Thanks Mike!